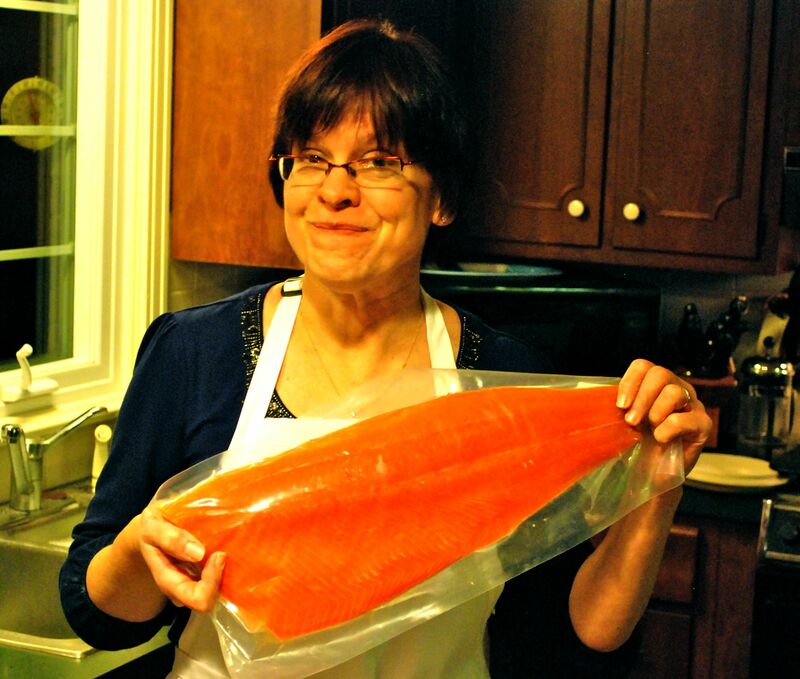 My mother, with a salmon. I read somewhere that becoming a mother is like letting your heart wander around, outside your body. Like cleaving it into as many pieces as you have children, and watching as they do what they want with it. And we children do not always treat our mothers gently. We don’t treat ourselves gently, or treat others the way we’d want them to treat us, and our mothers feel our indiscretions as an extension of themselves, our pain and infliction of it as wounds to their own, sectioned hearts. If there’s a harder, more heartbreaking, heartwarming job than motherhood, I’m not sure what it is. A dear friend of mine from high school has a daughter who turned two, last fall. She threw a bonanza birthday party, after which a group of us high school girls, long out of plaid skirts and knee socks, sat in lawn chairs in her garage, red solo cups of wine in hand. A baby monitor by her feet to keep an ear on her sleeping daughter, my friend looked at each of us. All unmarried, most unattached. All childless, in varying states of persuasion about the art, the craft, the calling. Today, on Mother’s Day, I look at facebook and twitter posts of people with their mothers. Photos of childhood memories. Old sepia-tinted copies of days long gone, of mothers passed or absent. I think about the stories behind each of those photographs, those 150-character proclamations. I think of the love and the depth of emotion so strong, its strength or absence defines us. My own mother is a model specimen. (And I’m not just saying that because she can read this blog, mom!) She raised my brother and I to be good people, to be spiritual people, to be the kind of people we’d want to call family or friends. She gave us the freedom to make our own mistakes and the distance to learn from them. She taught us to stand up and dust ourselves off after those mistakes leveled us, to look opposition in the eye and never to blink first. Once, I remember my brother had a bully who was pushing him around, on the basketball court and in class. He was in elementary school, a little tow-headed kid with skin so pale, he glowed in the sun. His eyes changed color, depending on what he was wearing, In his yellow uniform shirt, they were a bright, intelligent blue. We asked my mother how she knew. Kids don’t trust wisdom unless they know its source, and even then, all information that has not been obtained firsthand is suspect. “There was a girl in my class, who used to make fun of me,” mom answered, her face solemn as she wiped her soapy hands on her jeans. For years, I thought she’d killed her. We behaved ourselves for weeks, after that. But my brother did push the bully back, the very next week. Just last summer, that former bully smoked cigars on my parents’ back patio, drinking beer out of red solo cups and reminiscing about almost 20 years of shared history. Sometimes, it’s all about who blinks first. And that, I think, was the mark of my mom’s motherhood. She taught us to respect boundaries, both our own and other people’s. She would not tolerate intentional cruelty. But she also taught us when to push back. When to stand up for injustice and give it a good shove. Sometimes, even down the stairs. Happy mother’s day, to all the moms out there. Happy mother’s day to all the non-biological nuturers, whose roles in the lives of others are as rich, as deep and as necessary as that of the women who birthed us. Happy mother’s day to those who have lost children, who have buried pieces of their hearts and sewn the holes back up with steel sutures. Happy mother’s day to those who have lost mothers, grandmothers, or others who were mothers or could have been. That unbreakable thread goes both ways, and snaps back just as sharply, no matter which end has been cut. Hug a mother today, yours, if you will and can manage it. Feel the heart beating in her chest. It’s a starfish heart, growing new pieces every time she sends it out to someone else. If you’re lucky, you have a piece of one in your own body. Feel hers, and yours, and live in the love you’ve created. It’s a gift more powerful than life itself. Next How do we measure success?